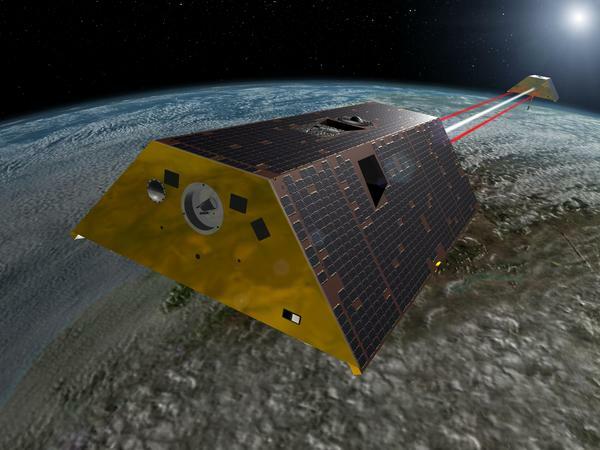 The Gravity Recovery and Climate Experiment Follow-On (GRACE-FO) mission, shown in an artist's rendering, will measure tiny fluctuations in Earth's gravitational field to show how water moves around the planet. GRACE stands for Gravity Recovery and Climate Experiment. The satellites measure — with exquisite sensitivity — changes in the Earth's gravitational field. They are one of the most important tools for understanding the effects of climate change, and they might also help predict earthquakes. The satellites rely on the fact that Earth's gravitational field is like bad gravy — it's lumpy. It's a bit stronger over places with lots of mass, like mountains or water or ice. And it's weaker where there isn't so much mass. You wouldn't notice the difference, but GRACE can. The two satellites fly in tandem, and variations in the gravity field beneath them pull them apart or together by less than the width of a human hair. That allows GRACE to create a gravity map. The map shows that the lumpiness varies from place to place, and from one month to the next. Felix Landerer, a geophysicist at NASA's Jet Propulsion Laboratory, explains that a lot of the variation comes down to water. "As snow accumulates in the mountains," he explains, "it melts in the spring, and into the summer, soil dries up. So that shift of water leaves an imprint on the gravity field, and that's what we detect and what we're after." Why are scientists chasing water? A warming climate is moving water around in ways that matter. Take the Greenland ice sheet, which is up to two miles thick. But climate change has melted a lot of the ice, and the old GRACE satellites caught this when they flew overhead. "The gravity field has changed because mass has shifted underneath, mostly in the form of water," Landerer says. Over the past 15 years, GRACE has watched as 4,000 gigatons of Greenland ice melted. Landerer says that's enough to inundate the lower 48 states some 19 inches deep. Luckily, that melted ice-water is still in the ocean. But it's not near Greenland. "Counterintuitively," Landerer says, "if you were to stand on the Greenland coastline and the ice melted, you would actually see the sea level in the ocean around you go down." That's right — go down. That's because the Greenland ice sheet is so massive that it exerts its own gravity field on the surrounding ocean. It pulls water toward itself, and when the ice sheet shrinks, or melts, the pull on the surrounding water diminishes. The weird result is that Greenland's meltwater can actually raise the sea level in places thousands of miles away more than it's raised nearby. GRACE picks up on that, too. It also detects movements in the Earth's crust, which could help scientists predict earthquakes. For example, when French scientists dug into some of GRACE's old gravity measurements from late 2010, they found the data showed that gravity fields around huge slabs of underground rock near Japan had started changing in an unusual way. Several months later, the huge Tohoku earthquake and tsunami struck, killing about 16,000 people. "The mass ... redistributions that they were seeing were different than anything they had seen in the previous eight years," says David Jacobson, a quake geologist who's written about the findings. So for eight years before Tohoku, nothing unusual. Then months before the quake, a strange shift in gravity. That got geologists looking in GRACE's database to see if that same kind of gravity shift occurred prior to other quakes. "If you're potentially ... able to see similar anomalies in other large earthquakes, you could potentially have maybe even months' warning if there is likely to be a big earthquake," Jacobson says. Geologists say this is far from a proven quake predictor. The Tohoku gravity signal could be a one-time event. Similar gravitational changes might not always predict a big quake at all. But no one will know without more data from GRACE. Tomorrow, NASA is set to launch two new satellites, collectively called GRACE. They're designed to measure tiny changes in the Earth's gravitational field. And as NPR's Christopher Joyce reports, those changes could tell researchers about everything from climate change to earthquakes. CHRISTOPHER JOYCE, BYLINE: The Earth's gravitational field is like bad gravy. It's lumpy. It's a bit stronger over places with lots of mass - mountains or water or ice - and weaker where there isn't so much mass. You wouldn't notice the difference, but GRACE can. The two satellites fly in tandem. Variations in the gravity field beneath them pull them apart or together by less than the width of a human hair. That creates a gravity map. The map shows that the lumpiness varies from one month to the next. And Felix Landerer, who's a geophysicist at NASA's Jet Propulsion Laboratory, explains that a lot of the variation comes down to water. FELIX LANDERER: As snow accumulates in the mountains, it melts in the spring. And into the summer, soil dries up. So that shift of water leaves an imprint on the gravity field. And that's what we detect and what we're after. JOYCE: Why are scientists chasing water? Well, a warming climate is moving water around in ways that matter. Take the Greenland ice sheets. They're up to two miles thick. But climate change has melted a lot of the ice, and the old GRACE satellites caught that when they flew overhead. LANDERER: The gravity field has changed because mass has shifted underneath, mostly in the form of water. JOYCE: Over the past 15 years, GRACE watched as about 4,000 gigatons of Greenland ice melted. That's enough to cover the lower 48 states in 19 inches of water. Luckily, that melted ice water is still in the oceans. But where is it? You'd think it's near Greenland, but not really. LANDERER: Counterintuitively, if you were to stand on the Greenland coastline and the ice melted, you would actually see the sea level of the ocean around you go down. JOYCE: That's right, go down. And you're dying to know why, right? Well, the Greenland ice sheet is so massive that it exerts its own gravity field on the surrounding ocean. It pulls water toward itself. And when the ice sheet shrinks, melts, the pull on the surrounding water diminishes. The weird result of this is that Greenland's meltwater could actually raise sea level in places thousands of miles away more than it's raised nearby. And GRACE picks up on that too. It doesn't miss mass, whether it's water on the surface or underground. And it also detects movements in the Earth's crust. That's why GRACE may also help scientists predict earthquakes. Here's how. French scientists dug into some of GRACE's old gravity measurements from late 2010. They showed that gravity fields around huge slabs of underground rock near Japan started changing in an unusual way. A few months later, the huge Tohoku earthquake and tsunami struck, killing thousands of people. David Jacobson is a quake geologist who's written about the finding. DAVID JACOBSON: The mass sort of redistributions that they were seeing were different than anything they had seen in the previous eight years. JOYCE: That's got geologists looking into GRACE's database to see if that same kind of gravity shift has occurred before other quakes. JACOBSON: If you're potentially able to see similar anomalies in other large earthquakes, you could potentially have maybe even months' warning of there is likely to be a big earthquake. JOYCE: Geologists say this is far from a proven quake predictor. The Tohoku gravity signal could be a one-time event. But no one will know without more data from GRACE. Christopher Joyce, NPR News. (SOUNDBITE OF DJ JAZZY JEFF AND DAVE GHETTO'S "COME ON") Transcript provided by NPR, Copyright NPR.